Where is The Andaman Sea located? Scuba Diving Phuket – Andaman Sea is a part of Indian Ocean which is located in the East of the Andaman & Nicobar Islands (India), West of Thailand and South of Burma. It is also known as Burma Sea. Many of the 155 Islands in the Andaman Sea are uninhabited and are crowned by primary vegetation tumbling down to shorelines punctuated by idyllic sandy beaches. It’s the Islands and beaches of southern Thailand that hold the greatest appeal for tourists and, whether you’re looking for great landscapes, scuba diving or nightlife attractions, there is plenty of choice. The Andaman coastline, to the west of the Kra Isthmus, boasts fabulous scenery and heavenly beaches. The largest and well-known of the islands destination is Phuket, which has been attracting tourists for a number of years and is now in full swing, high-rise hotels appear inexorably above the palm trees. Further south, the island of Koh Phi Phi and the beaches around Krabi on the mainland are slowly but surely building a foothold on the tourist map and, although not as established as Phuket Island, they are geared up to welcome all visitors – from independent travelers to families. The climate, scuba diving conditions and water salinity of the Andaman Sea are mostly determined by two opposing monsoons, the northeast and southwest monsoons. The Andaman Sea is sheltered from the worst effects of the northeast monsoon, and diving or snorkeling is at its best from November to April. Underwater visibility ranges from 10m to 40m or more. From May to October the southwest monsoon strikes the region, bringing in its wake heavy seas and strong currents and increased turbidity. But even during the southwest monsoon, most of the time the visibility is still between 10m and 20m. Tides are semidiurnal (i.e. rising twice a day) with the amplitude of up to 2.70 meters. 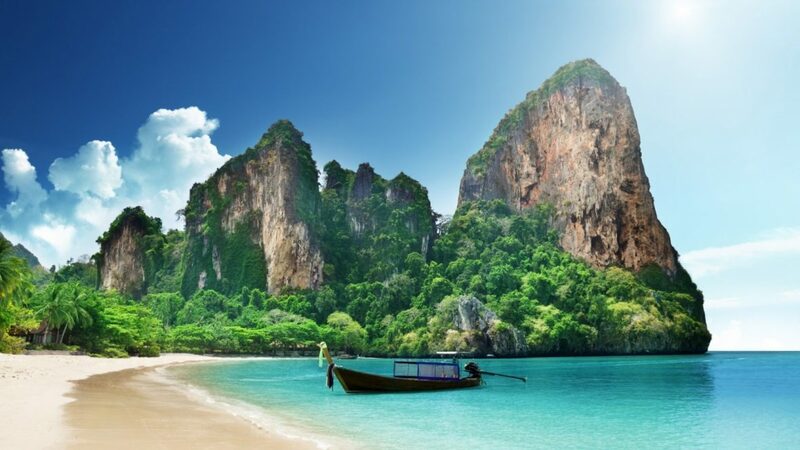 The Andaman Sea, particularly the western coast of Thailand and Malay Peninsula, is rich in coral reefs, marine life and offshore islands with spectacular topography, such as Phuket, Phi Phi Islands, Ko Tapu, islands of Krabi Province and Mergui Archipelago in Burma. Despite having been damaged by the 2004 Sumatra earthquake and tsunami, they remain popular tourist destinations. The nearby coast also has numerous marine national parks – 16 only in Thailand, and some of them are candidates for inclusion into UNESCO World Heritage Sites. The waters of the sea along the Malay Peninsula favor the growth of mollusks, and there are about 280 edible fish species belonging to 75 families. Out of those, 232 species (69 families) are found in mangroves, 149 species (51 families) reside in sea grass, and 101 species are common to both habitats. The Andaman sea also hosts many endangered fauna species – Whale Shark, Devil Manta Ray, Dugong, several dolphin species, such as Irrawaddy Dolphin and four species of sea turtles. There are only about 150 Dugongs in the Andaman Sea, scattered in Thailand between Ranong and Satun provinces. These species are rather vulnerable to the degradation of seagrass meadows. The Andaman Sea coastline, boasts fabulous scenery, beaches and world’s top diving spots. The largest and best known of the Islands is Phuket. The bests known for scuba diving are the National Parks of Similan and Surin Islands. This group of islands are considered as one of the top dive destinations in the world. In general the Andaman Sea has more extensive coral reefs with most of them around the offshore islands occurring on the east sides of the islands; due to the influence of the southeast monsoon the west coasts tend to have rocky slopes descending to 10-40m in depth with a great swim thrus and slots. Towards the northern end of the Thai coastline, a series of granitic outcrops lie in deep, clear water with reefs descending to 25-40m and beyond in depth. These are the Similan and Surin Islands, whose breath-taking underwater scenery and great diversity of marine life have gained them a considerable reputation in the worldwide diving community.